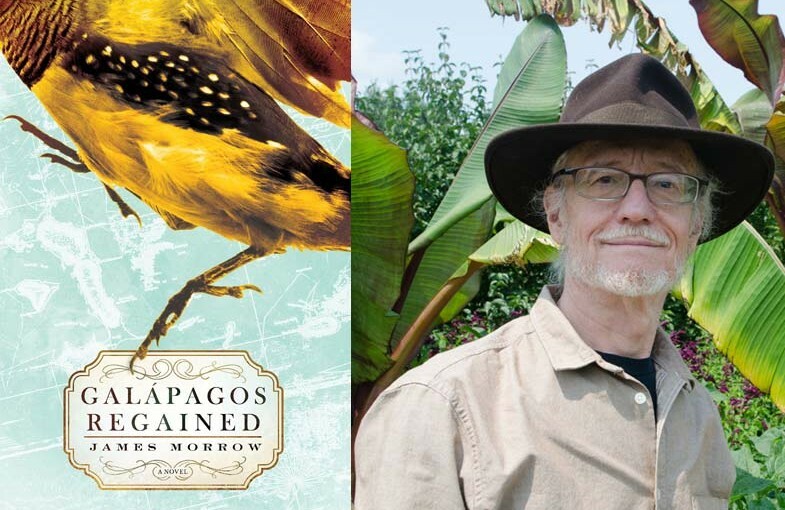 There is a remarkable scene—one of many—in James Morrow’s new novel, Galapagos Regained, wherein the final straw is broken for Charles Darwin and we are shown the moment he decided to back his radical new view of nature and its processes. Wholly fictional, no doubt, yet based on reality, Darwin has come to London to confront a young woman who has betrayed his trust while working in his household. The confrontation with the fictional Chloe Bathhurst is not the one that matters. Rather, it is the confrontation Darwin is having with the edifice of a loving god. His daughter is dying—tuberculosis—and the scientist in him knows there is nothing to be done, that an indifferent nature cares nothing for her goodness, her innocence, and any human claim on justice and fairness is but the empty babblings of a minor species only recently transcendent upon the ancient stage of life. Darwin is angry and resentful. The transgressions which resulted in his dismissing Miss Bathhurst are insignificant now against this greater, vaster crime which, he believes, has no actual perpetrator. The only thing he can do, he decides, is to give her his blessing in pursuit of her own goal, which pursuit got her fired from his service. She was fired for attempting to steal the sketch he had written concerning the transmutation of species, a precursor work to his epic On The Origin of Species. She did this in order to procure a means to free her errant father from debtors prison by using the work as the basis for winning the Shelley Prize, for which competition has been ongoing for some time in Oxford. The purpose of the prize to reward anyone who can prove or disprove the existence of God. Chloe, during her employ as Darwin’s zookeeper, became aware of his theory and thought it ideal to present and win the prize. Darwin refused. When she elected then to steal the notes and present it on her own, she was caught and dismissed. Darwin was at the time unaware that she had already made a copy of the paper and thought he had caught her in the act. Now, in the lobby of a London playhouse, where Chloe had once been employed as an actress, Darwin, aware that she in fact had stolen his treatise, is sanctioning her quest. Because this is what Chloe has determined to do. Go to the Galapagos Islands to gather specimens to support the argument for transmutation of species. The Shelley Society fronts her the money to do so, she enlists her card-sharp brother in the expedition, they find a ship, and set sail. The Society had already bankrolled an expedition to Turkey for the purpose of finding the remnants of Noah’s Ark, so this was only fair. Accompanying her ship is Reverend Malcolm Chadwick, anglican minister and formerly one of the judges of the Shelley contest—on the side of the deity. He steps down from that post at the request of Bishop Wilberforce and sent on this new mission to oversee what Chloe will do. He departs with uneasy conscience, made so by the second part of Bishop Wilberforce’s plot, which sends another minister in another ship with the intention to go to the Encantadas and set in motion the ultimate destruction by slaughter of all the animals on the islands, thus to deprive the forces of atheism their troublesome evidence. Chadwick finds this idea appalling, but he is faithful and says nothing. He joins Chloe’s expedition, which becomes Odyssean in its complications and obstacles. The novel proceeds from one adventure to another until Chloe herself, stricken ill in the Amazon basin, undergoes a kind of religious conversion, and decides she is wrong in her conviction that there is no god. Morrow then expands on the struggle she engages with her fellow travelers and her own considerable intelligence. What we are treated to in this novel is a thorough examination of human motivation in the face of shifting paradigms. It may be clear where his sympathies lie, but he is too good a writer to load the dice in favor of his preferred viewpoint. He gives his characters their own and follows them where they would naturally lead. He never denigrates faith, only the fickleness of our intentions in the face of conflicting desires and awkward choices. Tempting as it may have been in the end to simply declare a winner, Morrow instead takes a more difficult and fulfilling tack by portraying the times in which this debate flared into full flame with the advent of a solid theory of evolution. Chloe Bathhurst herself is an admirable character. An actress, adept as a quick study, she proves herself intellectually versatile and equal to any challenge. As well, those who both aid and oppose her are equally well-drawn and Morrow deftly clarifies their motives. Along the way, he gives a field demonstration in observation and interpretation, showing us the process whereby new understanding takes us over and how revelation can be a problematic gift. Morrow is one of our best writers plowing the ground of controversy. He never takes the simplistic road. The pleasure in reading one of his novels is that of being allowed free range of the imagination in pursuit of specific truths stripped of dogma. In fact, he disassembles dogma in the course of his yarns, a fact that is often not apparent while we’re in the grip of his artifice. An artifice made warm by the complete humanness of his characters. One his best creations is Chloe Bathhurst. In her, several clichés and canards are undone, as well as many perhaps uncomfortable but rewarding questions asked. She exemplifies the first rule of the explorer—never be afraid to go and see for yourself. Do so and you’ll be amazed at what is revealed. Induces best to hope of like success. Perhaps not so much to “ruin Adam” as to give us a view into a vaster garden, older and truer, and less a burden to our capacity for wonder.